Beau Geste (1939) is director/producer William Wellman's superb, high adventure tale set in the desert - a classic melodramatic, rousing film of the late 30s from Paramount Studios. The film was originally to be directed by Henry Hathaway, and touted as Paramount's first Technicolor feature, but neither came to pass. The screenplay by Robert Carson was based on the 1924 novel of the same name by English soldier/author Percival Christopher Wren (1885-1941). 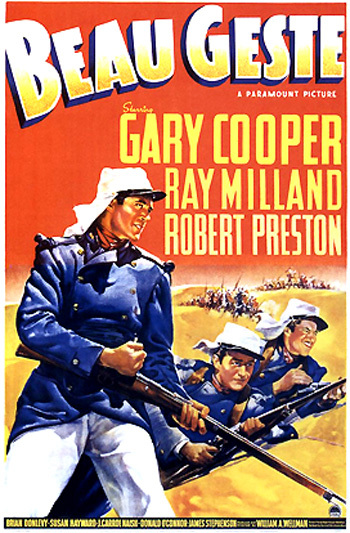 The themes of the film, involving three Geste brothers who disappear from England to avoid scandal and become members of the French Foreign Legion, include brotherly loyalty, patriotic honor, self-sacrifice, and treachery. The film received two Academy Awards nominations (with no wins): Brian Donlevy received his only Academy Award nomination (Best Supporting Actor) for his performance as the sadistic, horrendous Sergeant Markoff - the film changed his nationality from French to Russian to avoid offending the French legionnaires and French film audiences. And Hans Dreier and Robert Odell also received nominations for Best Art Direction, for their marvelous sets and production values. More importantly, the film featured four future Oscar winners - Gary Cooper, Ray Milland, Susan Hayward (in her film debut), and Broderick Crawford. Urged on by reports of a massed Arab attack, a column in command of Major de Beaujolais advances across the Sahara to the relief of Fort Zinderneuf. The fort, with its tricolor flag waving, appears 'defended' and manned with rifles cocked on every parapet. Major Henri de Beaujolais (James Stephenson) halts the column, and commands his bugler Digby Geste (Robert Preston) to "wake 'em up in there," but there is no response. After firing his pistol, two bullets from a rifle are fired in his direction and richochet on the sand in front of him. When he rides forward and approaches closer for a better look, the fort appears filled with an entire garrison of lifeless, dead Legionnaires' corpses propped up at every parapet. ...and I hereby confess that it was I who stole the great sapphire known as the "Blue Water" from Brandon Abbas. They plan to pitch camp in the nearby oasis for the night - "Tomorrow, I'll get to the bottom of this if I have to take a trip into the next world." Just then, shots are fired and heard from outside the fort. The column is ordered to withdraw, and "break ranks and fall back to the oasis" - it is assumed that there is an Arab or tribal attack. As they take cover, they look back - the fort mysteriously goes up in flames and is destroyed: "There goes the evidence...How am I going to make a report about this? If I say exactly what's happened, they'll say I'm mad at headquarters." - Who bayoneted the Sergeant? John killed Markoff with a French bayonet. And Beau died in his brother John's arms after giving him two pieces of paper: (1) the note publically confessing that he had stolen the "Blue Water" sapphire - a note that was to be put in Sgt. Markoff's hands, and (2) a letter to Lady Brandon explaining his actions - this letter is read at the film's conclusion. - Who fired the shots? John fired the two warning shots at the feet of the Major. Then, he jumped off the back wall of the fort and fled into the nearby desert. That's what I want when my turn comes. I'd give anything to have a Viking's funeral with a dog at my feet and the last post blown for me, if it weren't too much trouble. Lady Brandon's remaining fortune is based upon the possession of a family jewel and heirloom, a magnificent sapphire called the "Blue Water," kept in a secret hiding place behind the fireplace where Catholic priests were hidden to escape Cromwell's persecution: "This is called the Priest's Refuge. In Oliver Cromwell's time, the Brandons used to hide them here." Her dissolute, profligate husband, Sir Hector Brandon, has spent the entire family fortune until only one source of family income remains - the sapphire. It is "the 'great-great grandfather of all sapphires...it's the one thing Sir Hector really loves. Everything else he has but the estate has been gambled away." The valuable stone is worth 30,000 pounds. One of the children's fantasy games (of Medieval times, knights and King Arthur) includes hiding in a suit of armor in the main hall of the manor. Ensconced in the armored suit in the hallway, Beau accidentally witnesses and overhears the impoverished Lady Patricia secretly selling the precious sapphire to a turban-wearing buyer. In order to raise money to help support the orphans and provide for their education, she makes the desperate transaction. After selling the sapphire, she had replaced it with a fake gem. Augustus: Well, he wouldn't sell the Blue Water, would he, Aunt Pat? Aunt Patricia: I'm afraid that's what he intends doing. Augustus: Why! There wouldn't be anything left! Beau: Aunt Pat? Would you show us the Blue Water before you go? We may not get another chance to see it. It looks like a piece of sky that has become solid, with sunlight imprisoned in it. Cold sunlight, cold as the unhappiness it has brought so many people. Lady Patricia: I'm very much afraid someone is lying...Whatever the humor or the joke, it's rather bad taste to put on it. I think we're agreed on that. Perhaps our humorist wouldn't mind returning the Blue Water the way he got it - in the darkness. Turn off the lights, Isobel...Whoever took the Blue Water has had his chance. I don't want a scandal at Brandon Abbas. I will leave the box on the table until morning. If the Blue Water is not back by then, of course I shall have to call the police. Good night. Digby surmises that his brother has joined the Foreign Legion for anonymity and adventure: "Where would you go if you want to disappear completely and still have some excitement?" In short order, Digby also leaves home with the same purpose and a similar note for his brother John. It wasn't Beau but me. Love to Isobel. A sneer to Gussie [Augustus] and a command to you - grow up to be a credit to those two criminals, Beau and Digby. John must leave his love for Isobel behind to join his two brothers: "I think at least one of the Gestes ought to kiss you goodbye. I've been in love with you for a very long time. I just didn't know how to say it. And now that I do know, I - it's too late." As he departs, he confesses to Isobel: "If I had stolen anything from Brandon Abbas, it would have been you."